Blackjack is a noble ancient card game which demands a kind of certain etiquette during performing. There are some do's and don'ts for gamblers while playing the game which are recommended to stick to. The blackjack etiquette rules should not be strictly observed but every player recognizes those are better to become a habit while playing. It goes without a doubt the gaming process brings more pleasure if both the players and casino employees show their respect to each other. In case you have chosen a role of the onlooker near a blackjack table it's ok, but be polite and stay on the reasonable remoteness from the players. They probably won't be delighted by someone staring right at their cards. 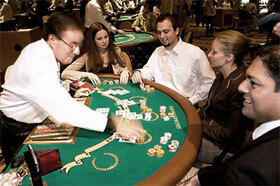 Try to learn the rules of blackjack properly before playing at the table with other players. The gaming process shouldn't be hampered by your unawareness. Moreover, it can seem irritating to other players. You should always remember that tipping the dealer is an important part of the blackjack game. Encourage the dealer via some tips especially in case you win. One of the most pleasant methods to tip an employee is to place the bet on his behalf. You can easily place a bet out of the betting circle right near the dealer. Do not touch the cards which were dealt face up. You can only touch those in case you play a face down game. Try to avoid the spilling of different drinks while playing. Actually it is better not to order drinks if all players wait for you to start the game. And, of cause, do not drink much. It is not really polite to talk much during the game. Moreover, you may offend other players by criticizing their manner of playing or needless advices. Do not ask a dealer for advice concerning the game. Always keep in mind that he works for casino and you put him in an awkward situation. Mostly the player-dealer communication is performed by certain hand signals. There are different signs at face up and face down blackjack game.